These pictures were taken on November 1st, 2005 - nine days after the everything piled in the corners pictures of october 22nd, 2005. 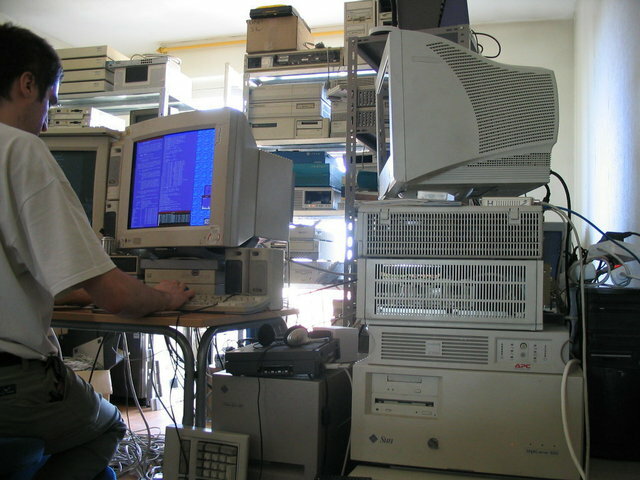 The setup was still a work in progress, with many machines put in the shelves without being wired (electricity and network) yet, but at least out of the way. 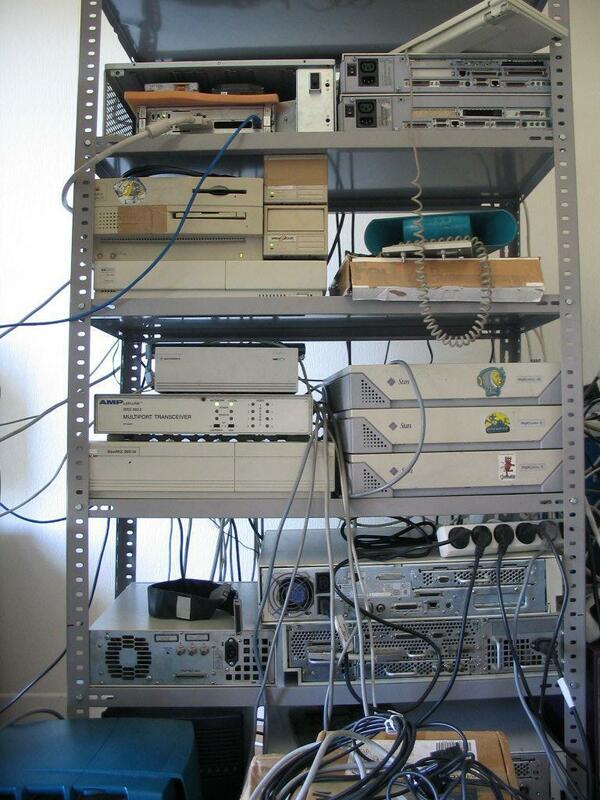 The setup was not final, and you might want to compare with the march 2009 pictures to see a more mature setup. It was still a warm and sunny autumn day, and I had opened the windows. They might be hard to see, with all these machines in the room. 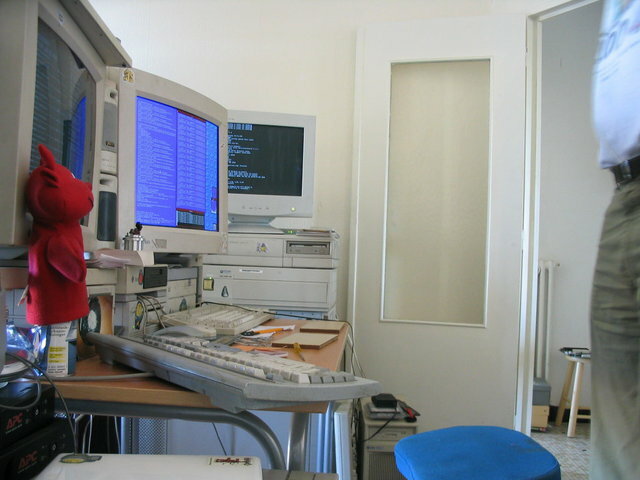 The most important parts were in place: my work area, and the three sets of shelves (as I did not own more than three back then - as I am writing this text almost six years later, this sounds odd, I don't remember well how it was to have so few shelves). 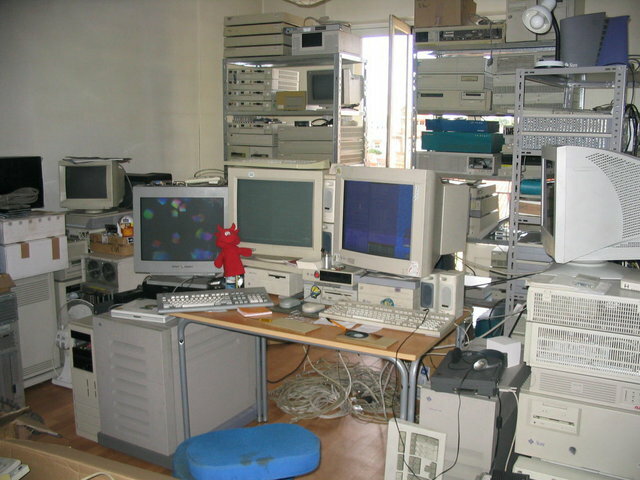 The west wall, to the left of the picture, was still used as temporary storage as there was still work to do to complete the machineroom setup. There are no pictures of this side (they would be boring), and the best you can see is the unsorted piles in this picture. The east wall sports the smallest shelves, which used to sport the so-called babel tower in the previous years. 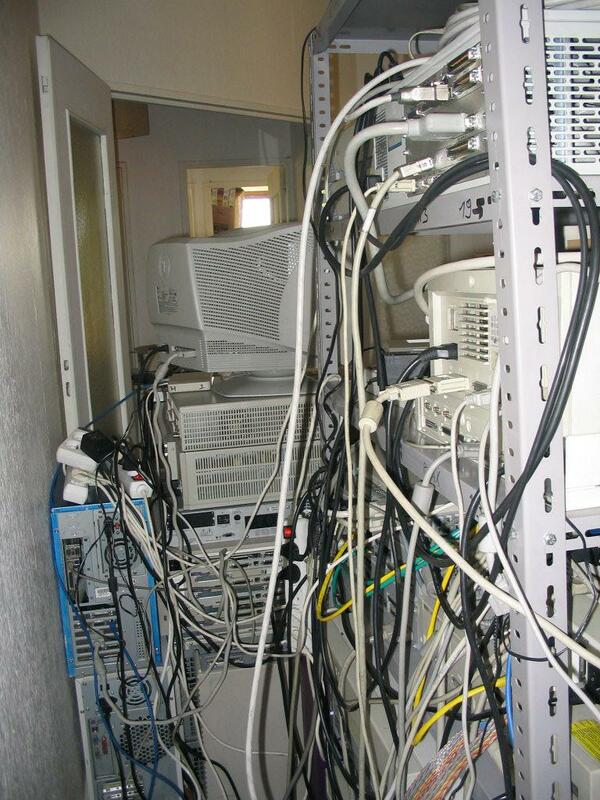 It is much less impressive in these pictures, and there was a lot of wasted space in it. The truth is, I had started to suspect the shelves had been slowly damaged from putting too much weight on them, and that they would risk collapsing on their side eventually. These shelves were indeed replaced with stronger ones a few weeks later (as can be seen in the 2009 pictures). What a waste of space here. 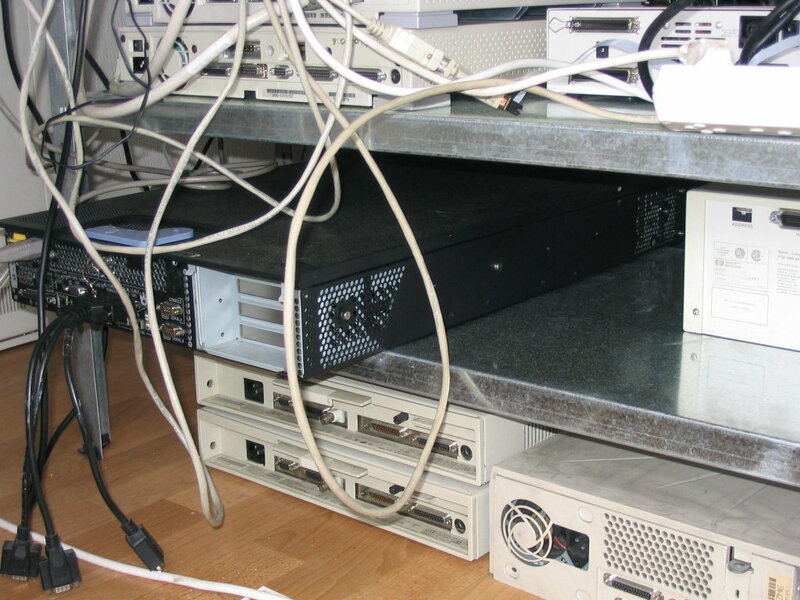 On the top, the good old 3-slot VME cardcage was still running (until its power supply died a couple months later). 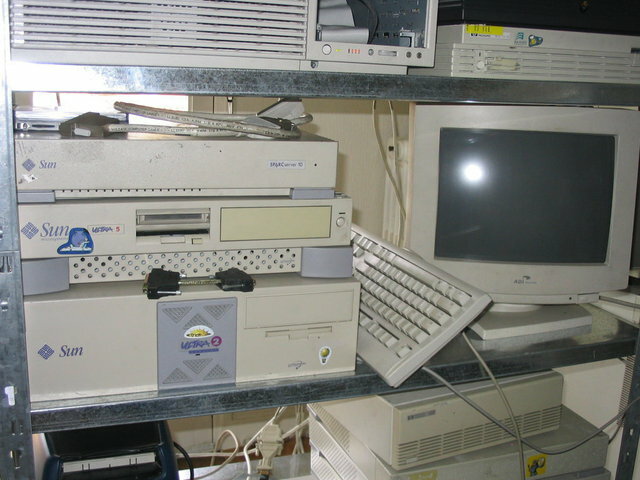 Next to it are two SPARCstation test machines fitted with various SBus cards. 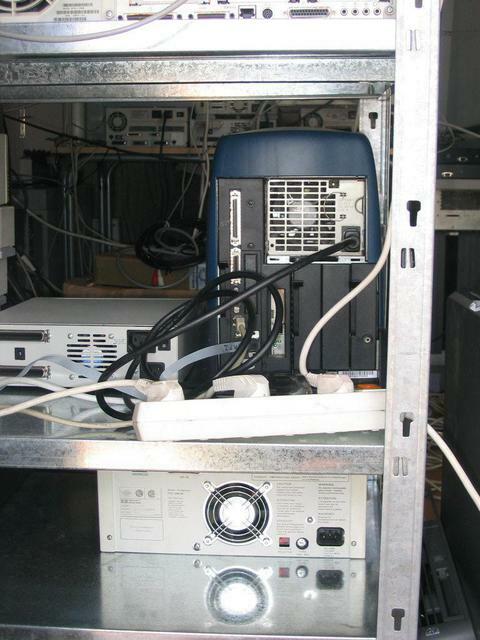 On top of the VME enclosure, AUI cables and an MMJ serial cable. 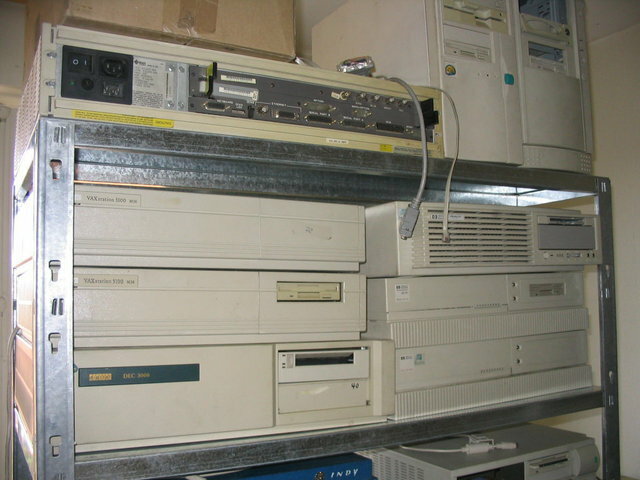 On the lower area, one can see my recently obtained HP 9000/425e system, with a Macintosh Quadra 650 on top of it, and external disks for the VME enclosure. 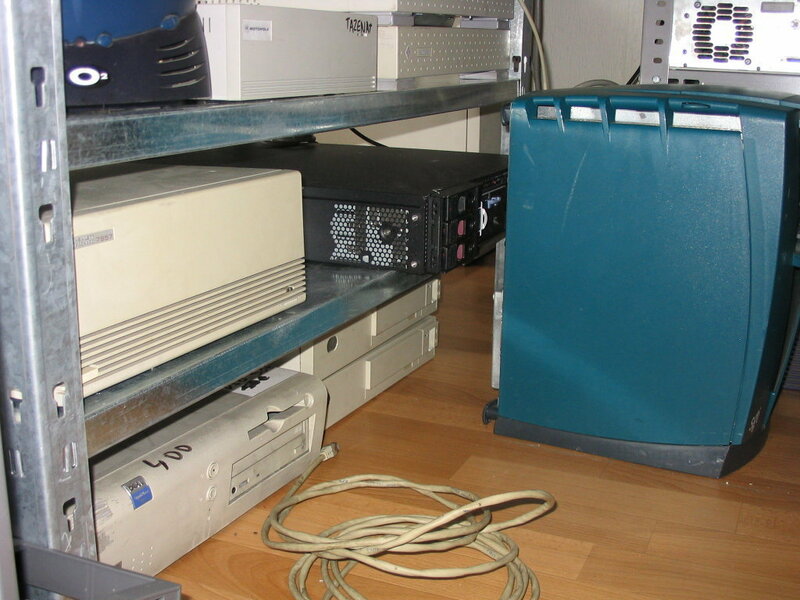 To the right, the front cover of the VME enclosure, Indigo2 feet, and a box of random things. 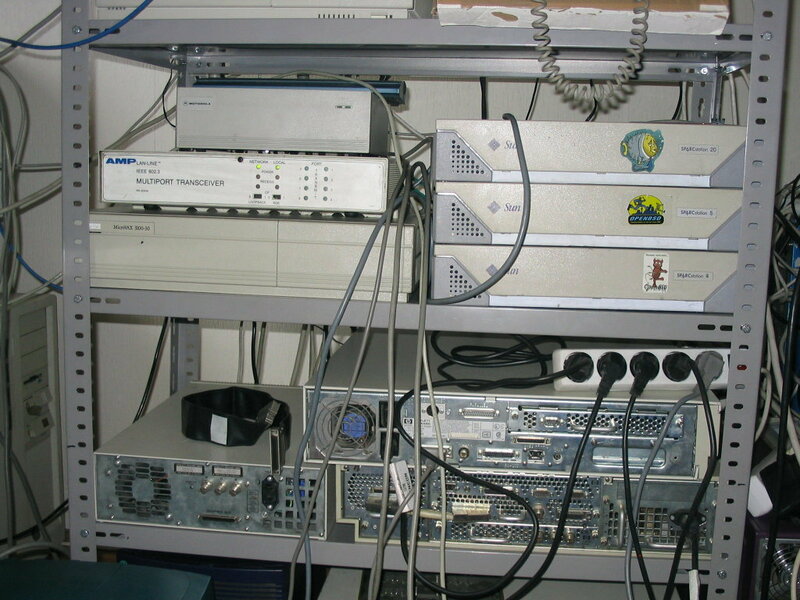 Looking further down, the middle area hosts, from bottom to top: on the left side, the local MicroVAX webserver, an AUI (10base5) hub, an external drive enclosure, and a 10Mbit/s 10baseT hub (I had not started to use 100Mbit/s switches yet). 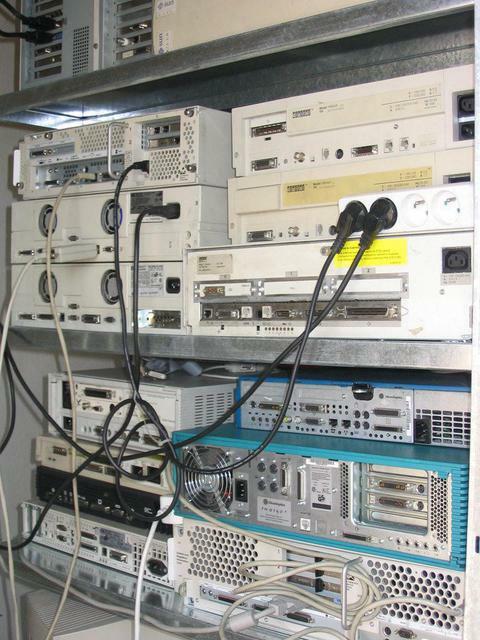 On the right side, the usual three main machines of the network: the gateway, the file server, and my main workstation. The lower area is wasting a lot of space. 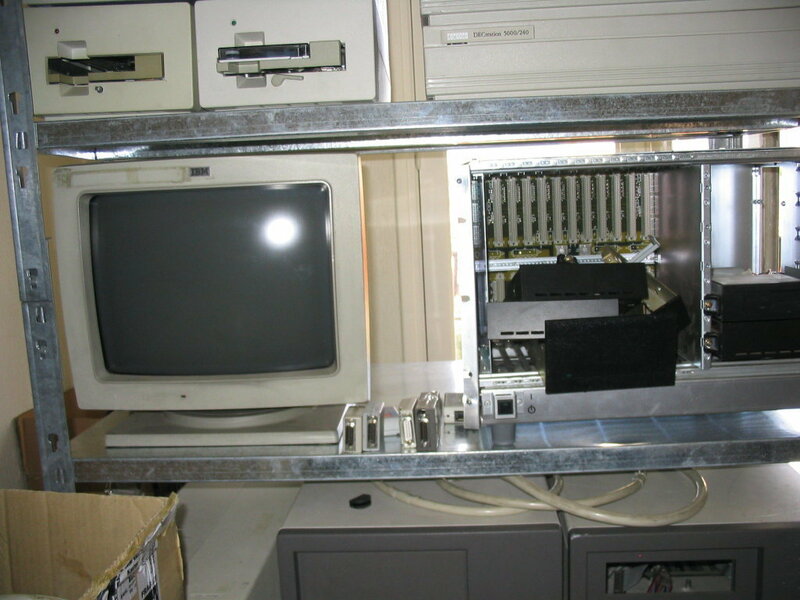 There are only two machines - an HP 9000/720 set under an HP 9000/425t, and an external HP TurboVRX frame buffer box to the left. Straight on the ground, three HP 9000/400 machines (one 400t between two 425t, to be precise) are making sure the dust won't hit the ground. Of course, the back of the shelves is nothing but, well, cable-happy. 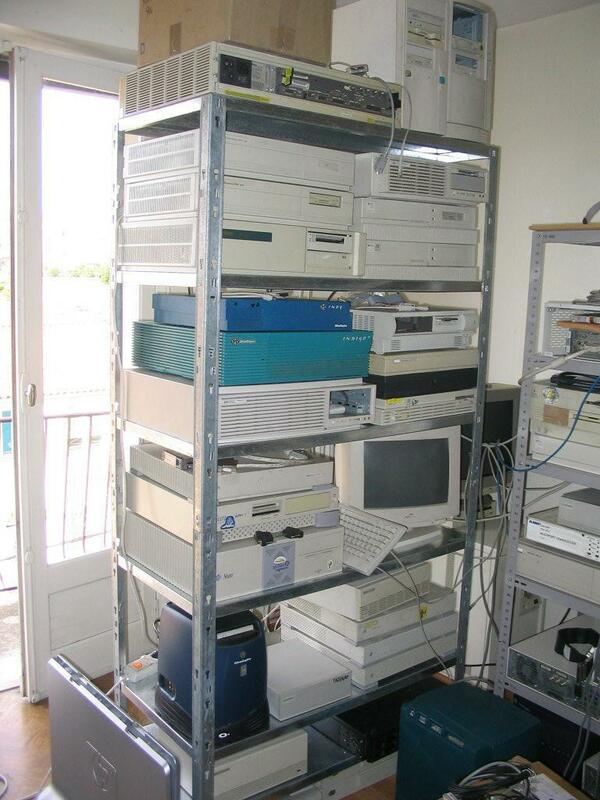 The larger shelves were set close to the windows, in order to have a good airflow. The windows were facing north, and except at sunset during the summer, they were never getting direct sunlight. On top of the shelves, a couple barebone PC chassis sit next to a working Sun 4/110 system. Below them, two VAX systems and a DEC 3000/600 TURBOchannel alpha sit next to three PA-RISC systems (from bottom to top, an HP 9000 715/100XC, an HP 9000 715/33, and an HP 9000 B132L). The next shelves host wider-than-average systems next to narrower-than-average systems: to the left, from bottom to top, an HP 9000 C240, an SGI Indigo 2, and an SGI Indy; to the right, from bottom to top, an HP 9000 712/64, a NeXTstation monochrome (slab), a VAXstation VLC, and an Acorn RiscPC 610. 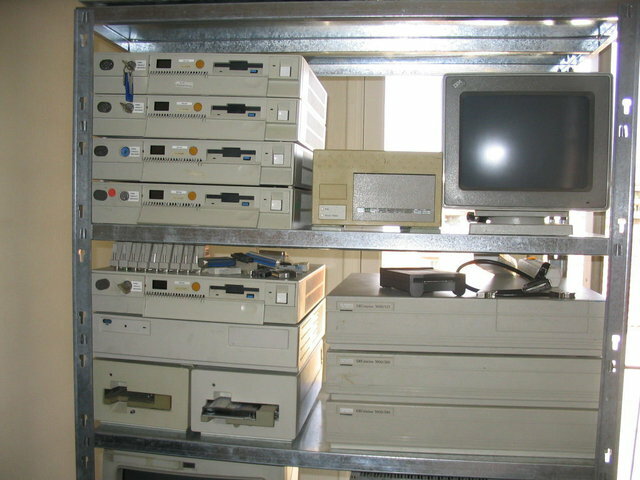 Under them, a few SPARC (and UltraSPARC) systems, random cables, and a 14" CRT connected to the Macintosh Quadra 650 from the east wall shelves. Further down, an SGI O2 with the CD-ROM drive tray skin having fallen apart, more SPARC systems, an external SCSI enclosure, and an HP 9000/318 system. 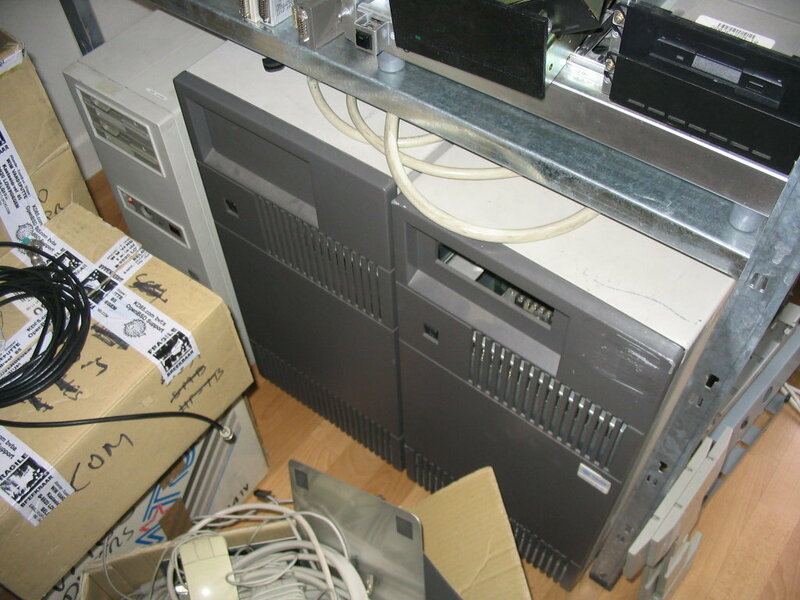 Behind this, to the right, you can guess the shape of the RS/6000 550H system with its external CD-ROM drive and its huge CRT sitting on top. 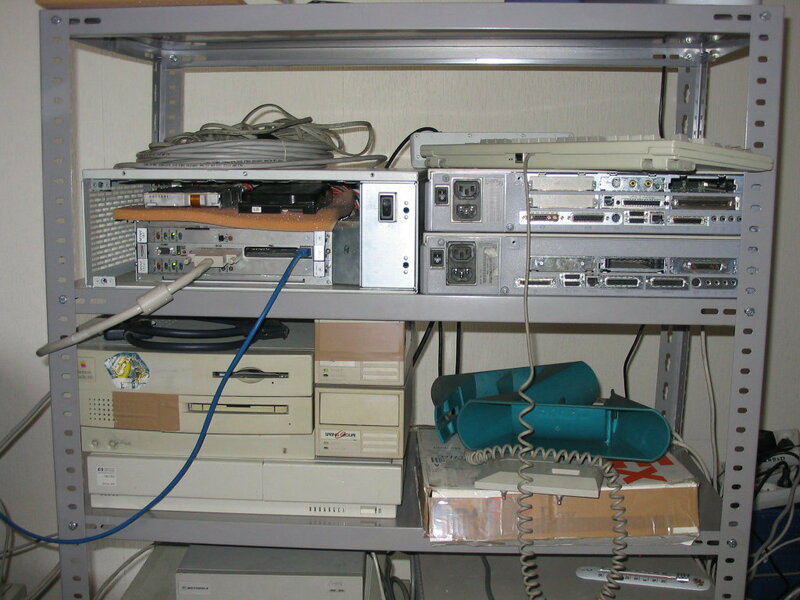 The final two areas are an HP-IB external disk enclosure next to an HP rx2600 Itanium system, and on the ground, two IBM XStation 130 terminals next to the remains of a Dell desktop PC I wanted to reuse as a small case for my CATS ARM board. 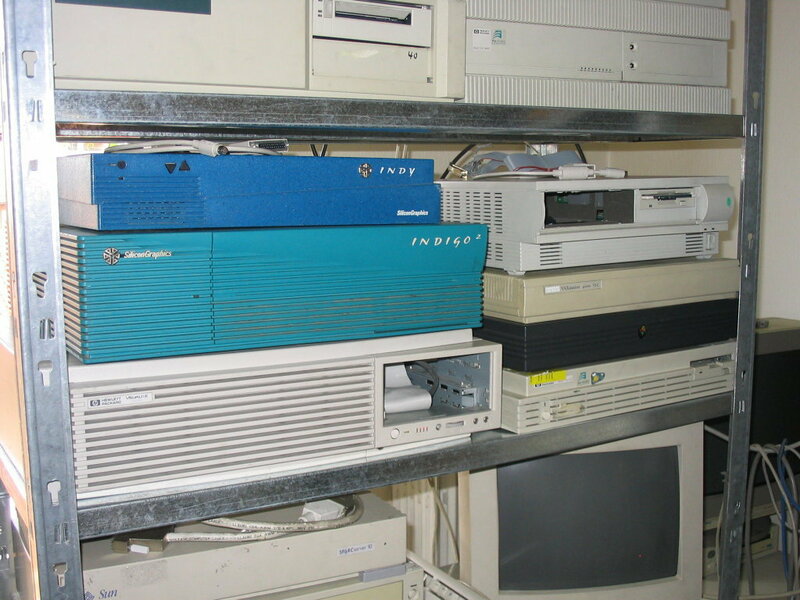 The turquoiseish system on the floor in front of the shelves is an SGI Octane. Looking behind the shelves, you can see that not many systems were ready to use; I had just started to put power and network cables in the shelves. 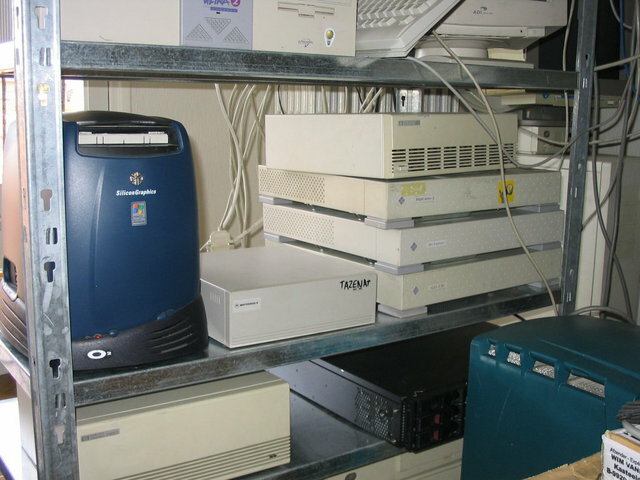 The northwest shelves were set up almost perfectly the first time, since there were almost no changes to their setup over the years (compare with the 2009 pictures, apart from the UltraSPARC 5 system moving to the top of the shelves, the VME cage being populated, and the Sun 3/60 systems switching places with the IBM RS/6000 220/230 systems, nothing else changed position). 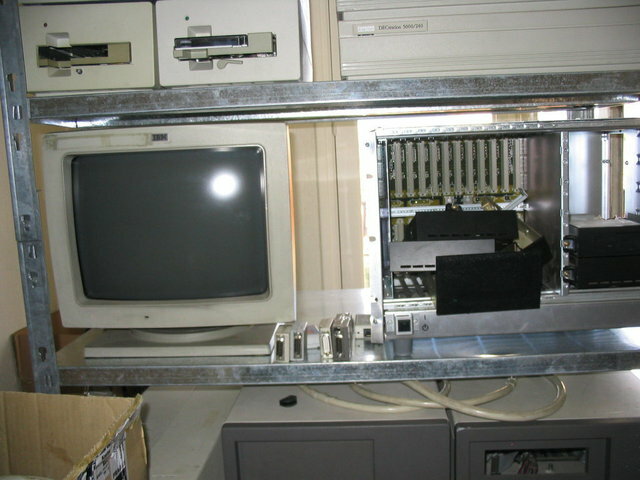 Under the Digital systems, the two tape drives of the IBM RT/PC are still waiting for work. 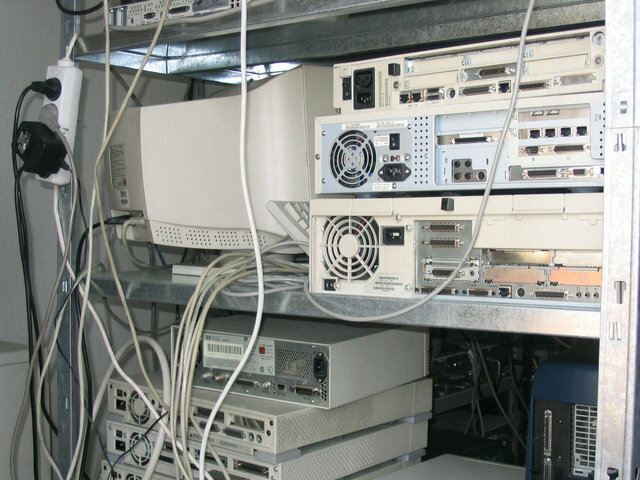 The RT/PC itself is the white tower on the ground, barely visible under the last shelves, on the left. And its 13" CRT with the RT/PC specific video connector is ``on top'' of it. 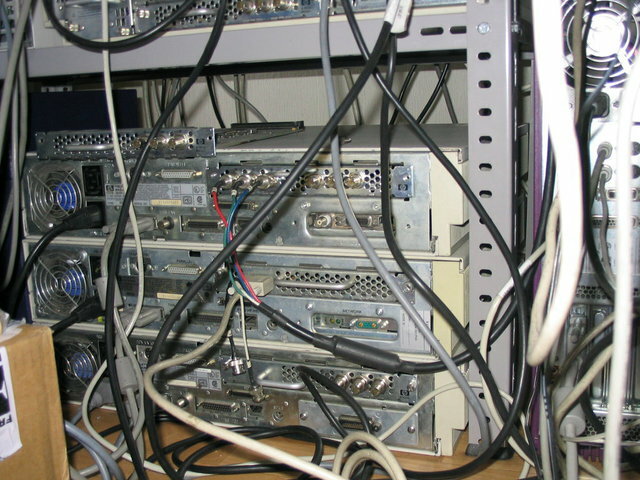 To the right, the empty VME cardcage was not yet set up. 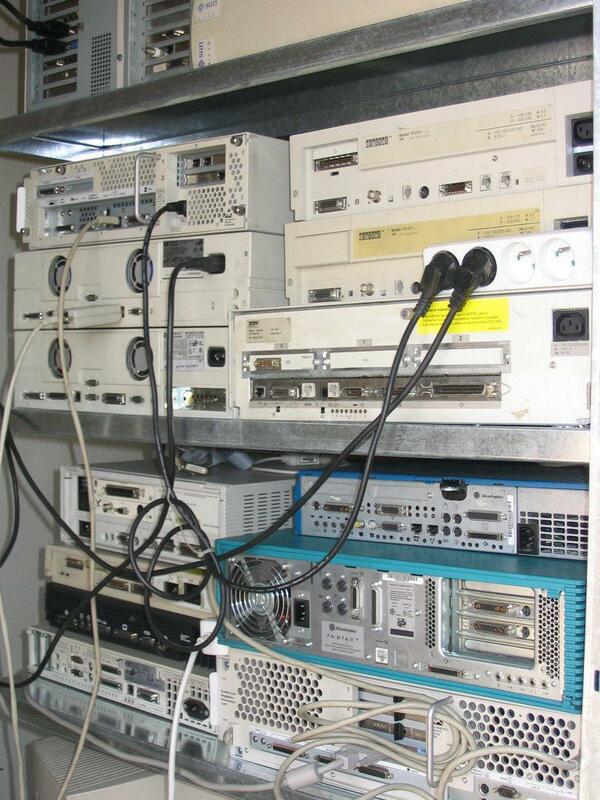 This picture provides a slightly better view of the RT/PC. 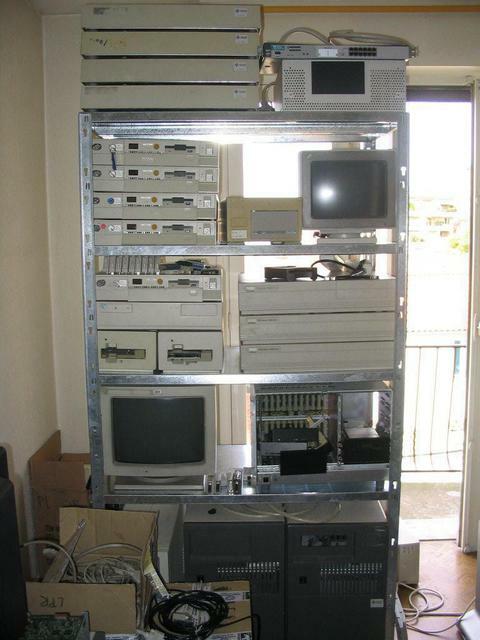 Next to it are a Sun SMD disks cabinet, and a Sun 4/260 system. I was still using IRIX as part of my desktop environment, back then. The screensaver of the day was Octahedra (I would switch between Octahedra and Electro Paint on an irregular basis, depending on my mood swings). 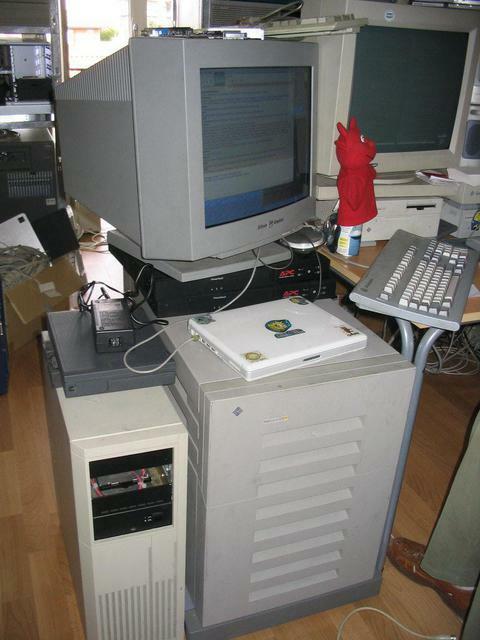 Since my work table is a bit small, I conveniently used the Sun 4/690 case as an extra table, and put two dead UPS on top of it for the IRIX screen to be in a correct position. 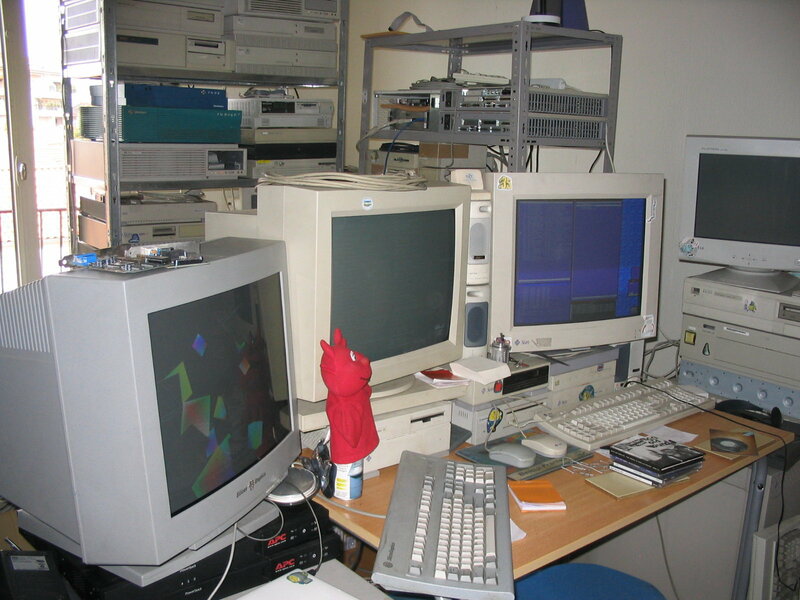 Left to it, a smaller VME enclosure, which was not yet set up, only acts as a smaller table upon which a Tadople SPARCbook 2 laptop is laying. 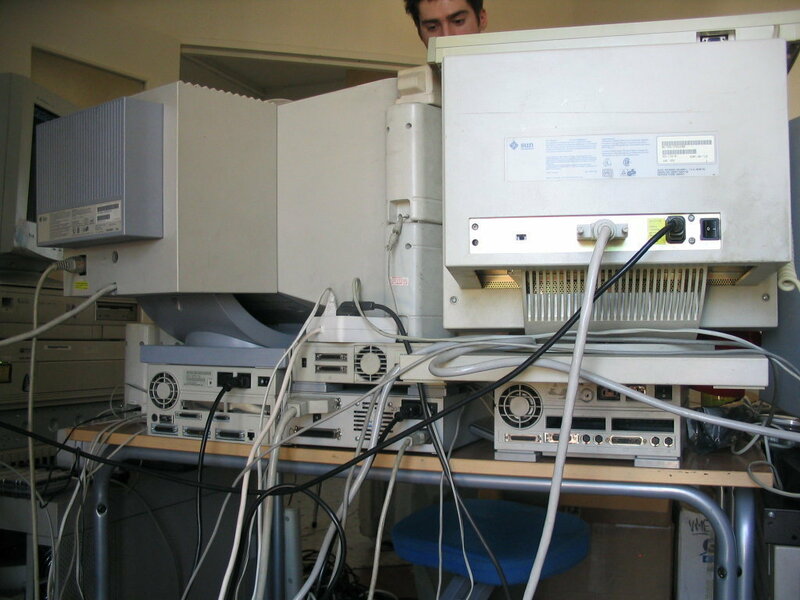 The right side of my work table is not empty either: one can notice a Tadople SPARCbook 3GX laptop on top of a Sun 4/330 system, and a pile of huge systems (on top of an HP 9000/827S on the ground, of which the top is barely visible), a Sun SPARCcenter 1000, yet another dead UPS, a VAX 4000-106, a VAXstation 4000/60 and another CRT. The astute reader will also notice the blue and black alpha is still there, to the right edge of the picture.